Fiona was found on the side of a busy highway in 2002. She was probably a discarded "Easter bunny." A person walking his dog, who was involved with dog rescues, saw her and rescued her. She probably would not have lived three more days otherwise. She was in a few foster homes for the next year-plus. In the summer of 2003, we knew nothing about rabbits. We had acquired Mike, our cat, at the beginning of 2000. He hated cats, and in fact came to us because he did not tolerate the other cats in his former household. We didn't feel we had the space and time for a dog. I heard about Friends of Rabbits, and saw on their web site that they had lots of rabbits who needed to be adopted. Maureen and I talked it over and decided we could try fostering. I went to a Friends of Rabbits adoption event. All the bunnies were cute. 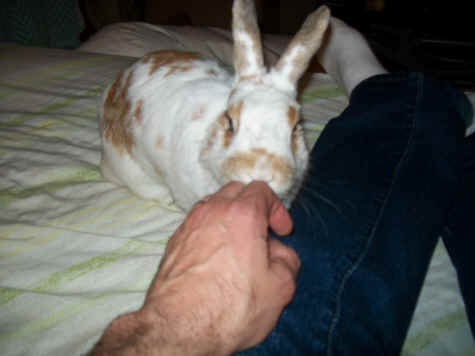 Vineeta, the person I talked to, mentioned a few rabbits who might be suitable, including Fiona, a 5 1/2 pound English spot cross who had recently been spayed. Two representatives came over to our house with Fiona. They set up her pen and provided a litter box, litter, hay, and other bunny essentials. We had decided that the spare bedroom upstairs would be the best place for her. They talked to us about rabbit care and gave us two books and a guide to safe foods. Before they left, we all went upstairs to see Fiona. The two people from Friends of Rabbits said goodbye to Fiona; we said hello to her. The first few days went fine. It was all very new - feeding salads and hay, watching bunny behavior, interacting with her as she got to trust and know us. Then she stopped eating. We called Friends of Rabbits, and took Fiona to the vet. They hydrated her and gave her some medications. Within a couple days, her appetite was normal again. The next week the same thing happened. The vets did the same treatment. They weren't sure what was causing the problem. By the third episode, we were quickly learning the signs of GI stasis. The vet who treated her offered us the option of giving Fiona subcutaneous fluids at home. We decided to give that a try - it would be cheaper and more responsive than going to the vet each time these epiosdes occurred. Giving sub-Q fluids was not easy. Fiona's skin was tough; she didn't like being poked with a needle and having to remain in place while fluid drained into her. I didn't like doing this to her. But we did what we had to do. We were getting quite an introduction to rabbits. When she was well, Fiona was very sweet. She enjoyed washing my hands and being petted. She handled the adoption events very well. Unfortunately there were far more adoptable rabbits than good homes, and I realized that we may be fosters for a long time. The pattern of weekly GI stasis continued. No one knew the underlying problem. By about the sixth week of this, my sense was that she was getting worse. I called Friends of Rabbits and asked if there were other approaches we could take. They mentioned a vet in Baltimore, Dr. Gold. I called Dr. Gold's office. It was a weekend; I left a message describing Fiona's symptoms. After running some errands, I saw there was a phone message from Dr. Gold. He said he had a hunch what the problem was. I drove up to Baltimore with Fiona. Dr. Gold explained that based on the symptoms, Fiona may have leftover tissue from the spay surgery. This tissue could wrap around her urethra and/or her colon. The hydration would temporarily relieve the symptoms but not solve the underlying problem. He performed a two-hour operation the next day. I went up see Fiona. A vet tech carried her to the visiting room, layed out a towel on the exam table, and gently placed Fiona on it. She was recently out of surgery and still groggy. I put my hand near her and she groomed it. In the back of my mind, I had a feeling this was going to be more than a foster relationship. I was very impressed that Dr. Gold guessed the problem simply from a phone message. He said the operation was a success. The next day I took her home. 24 hours later she was full of energy. She even hopped to the top of the bed, something we had not seen before. The next eight years were nearly problem-free. We fell into a nice routine. We found out her favorite hay, and that she was very picky about her hay. We got a long cardboard tunnel that she could run through. We mixed up her salads and gave her two small servings of pellets each day. She gobbled up the salads and was so excited when we served her pellets that she danced around in circles and knocked the pellets out of my hand so she could start eating. Fiona let us know that two hours of out-of-pen time each day was not enough for her, so we kept the pen open and let her have the whole room. We bunny-proofed the other upstairs room - the "TV" room - and began letting her in there for brief periods each day. She loved to go under the futon for a while, and then hop on top and join us. The three of us would relax and watch TV. She'd come over to each of us for petting, toss a toy or two overboard, groom me for a bit, then flop between us. We also started giving her an Oxbow veggie or barley treat each night. She loved these treats so much that she would climb all over me as soon as she heard the bag. It took her about a minute to chew the treat, and she would remain frozen in position until she chewed every last morsel. Maureen and I would also freeze, as to not destroy her concentration. Before too long she had free range of the whole upstairs. Life was pretty care-free for Fiona. Occasionally, when we were upstairs, Mike the cat would quietly walk up the stairs and join us. Reflexively, Fiona would dash for cover, but come out five minutes later. She gradually got used to him, though, and even walked up to him sometimes. 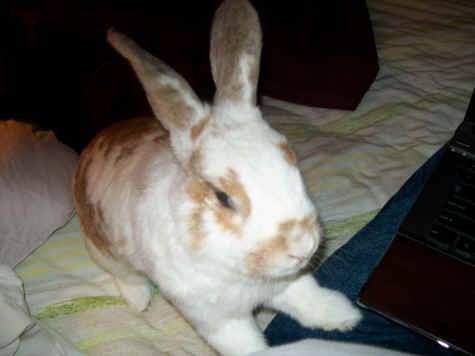 After a while it occurred to me that since there were always other adoptable bunnies in worse situations than Fiona, it could be a long time before she got adopted. By this time she was an integral member of the household. We changed our relationship from fosterers to adopters. Fiona was now an official member of the family. We further improved her upstairs habitat, with more toys, mats under the futon in the TV room (which was now always pulled out so she could have a larger "fort" underneath), and a second hay box in the TV room so she didn't have to run back to her room each time she wanted to graze. I would bring a succession of cardboard boxes into the TV room, and Fiona enjoyed "battling" them - biting them, pushing and pulling on them. We learned that one of the games she enjoyed was being fed through the pen bars. She would run outside the pen and I'd feed her from inside. I'll never forget that little nose and mouth thrust as far as they would go in the space between the bars, eagerly awaiting the next pellet or piece of salad. She had a few infrequent bouts with GI stasis, but we learned that these were almost always caused by tooth problems, so we got on a regular molar trim schedule and that practically eliminated eating issues. For the most part, her health was perfect. We could count on her devouring her salads twice a day, making big indentions in her hay from grazing, and finding perfect poops each morning in her litter box. Every now and then we'd have houseguests. Sometimes they stayed in her room, and she was fine with that. I "warned" guests that a bunny may hop in bed with them. No one seemed to mind. Other times, the guests would sleep downstairs and we'd sleep on the futon in the TV room. Fiona thought this was fun, because the covers on the futon were something to explore, and because she could pay us an early morning "wake up" visit, which usually meant that we'd be woken up by whiskers. As the years went by, our relationship with Fiona deepened. Somehow she got to be nine years old. I marveled that things had barely changed. She was full of energy - though she flopped a bit more than she did as a youngster, her eating habits were near-perfect, she was always at a good weight, and she was as social as ever. I knew in the back of my mind this could not last forever. 10 is a good lifespan for a house rabbit. One night I was petting her in her litter box, and I told her - not in a sad way - that when the time comes, I hope it is quick, and that we will celebrate her life and be happy that it was so good and filled with contentment, fun, good food, health, and affection. In late 2011 she had a longer-than-usual stasis. Ultimately it turned out be to a tooth problem that occurred before our scheduled visit. But for a few days, the vets could not get her to eat no matter what they did - even after they trimmed her molars. We took her home not knowing what to expect. That evening, she ate some hay and greens. At first I hand-fed them to her; then she started eating on her own. We were elated. She was at home, filled with love, her familiar surroundings, and her favorite foods and hay. She was back to her normal happy self in a few days. Toward the end of February, 2012, Maureen called me upstairs. She was in the TV room with Fiona. She said Fiona made a strange noise, like nothing she had ever heard. I was about to go to an open mike to play music. I stuck around for a while. We didn't hear the noise again and Fiona seemed perfectly fine. The next morning I heard the noise also. It sounded like an involuntary throat clearing. It sounded unnatural and like nothing we'd hear, or expect to hear, from a bunny. I also noticed that by mid-day her appetite had waned a bit. I took her to the vet on an emergency basis. The physical exam didn't show anything wrong. Her heart, liver, and kidney numbers looked good. The only abnormal finding was a bit of congestion in one of the lungs. It looked like an infection, so we started her on Baytril, an antibiotic. Things got worse. She started shaking and pawing at her ears more than usual, and losing her appetite. We determined, from looking at her past records, that the loss of appetite was probably a side effect of the Baytril. Also, on a follow-up vet visit, they found a couple of tooth spurs that could also be contributing to GI problems. Between those facts and the head-shaking, the treatment changed to penicillin. The penicillin would be injectable, so it would bypass the digestive system and probably not contribute to any eating problems. I had trepidations because of the experience long ago with injecting sub-q fluids. The technicians assured me that this was much easier and better tolerated by rabbits. They were right. Once I got the hang of it, the shots were no big deal to Fiona. In fact, after a while, we think she practically looked forward to them because she got a treat afterward. By the end of the 14-day course of penicillin, she was mostly better. For whatever reason she did not seem to have her full appetite for pellets, but aside from that she was normal. This was a big relief for us. A month later we heard the noise again, a couple of times. We were disappointed - things had been going well - but we wasted no time taking her to the vet. After discussing various options, we decided that we would take the conservative option - one more round of penicillin, since sometimes a longer course is needed to get rid of all the bacteria, and it did seem to help. Things went pretty well. By now we were pros at giving shots. Her ears bothered her for a while, but that gradually subsided. Her appetite was pretty good, though not great. We knew she was not a young rabbit anymore, and that recovery periods were likely to take longer, and that her appetite might never be quite what it was in her youth. We gave the 18th dose of penicillin on a Sunday night, and on that night - which we will never forget - it seemed like we might be totally home free. Fiona flopped with us, played with her toys, had a spirited battle with a cardboard box, ate lots of hay, and for the first time in weeks ate all her pellets. We had a wonderful night with Fiona and must have said "Who's our good bunny?" to her a hundred times. We were elated. On Monday, her appetite and energy level declined a bit. However, by this time we had gotten used to up and down progress with good days and bad days. We gave the 19th dose of penicillin, which went well. Only two shots left. That night, she gave me the most thorough grooming I'd had in years. On Tuesday morning, I saw that Fiona had not eaten any pellets overnight, although there were some decent-looking poops in her box. She went right to her breakfast. She took a few bites, then I heard the throat noise. My heart sank. The penicillin was not getting rid of the problem. She stopped eating, but eventually returned to her salad. She even ate a few pellets. But after a few more bites she made the noise again. It sounded a bit wetter. I heard the noise two more times. We had never heard it more than twice in one day. I made a vet appointment for 2 o'clock with Dr. Crumb, who was usually the one to give her molar trims over the years. Fiona had gone underneath the futon. When she does this during the day, it means she's not feeling right. But she wasn't hunched over in pain, and she seened inquisitive when I put my hand down there to pet her through the slats. I decided to let her be, and see if she would come out on her own. I went upstairs a couple more times and offered her some of her favorite foods: banana, grass and dandelion greens from the yard, and one of the Oxbow veggie treats that we gave her every night. She accepted them all. This was good to see, and meant that she was not too uncomfortable. I put some fresh hay and litter in her carrier in preparation for the vet trip. I did have to retrieve her from under the futon, but that was not too traumatic. Her exam went well - no obvious abnormalities, no signs of blockages, swollen lymph glands, etc. We decided to check her teeth, since she hadn't been eating quite as much hay as normal, and so wasn't filing down her teeth as much as usual. We also decided that while she was under, we would do an x-ray. It would be about half an hour. I read magazines and walked around the parking lot. Dr. Crumb called me into a room where we could look at the x-ray. It was bad. I don't remember all the details, but her lungs were shutting down. She had lost most of the capacity in her left lung and it was spreading to the right one. The prognosis was not good. At this rate she might might not be able to take in enough oxygen in 48 hours. A part of me went numb. "This isn't happening," I thought. During the exam we had been talking about trying antihistamines and other antibiotics. I wasn't prepared for this. I tried to remain rational and focused. A voice over the intercom said "Dr. Crumb, we need you to apply oxygen." He excused himself for a minute. Believe it or not, I assumed this was for another patient. Just before he talked to me, someone had come in with a bird on an emergency basis. In retrospect, I'm glad I was so naive and optimistic. Dr. Crumb returned and explained that he had to give oxygen to Fiona because apparently she had been breathing harder than normal the last couple days - even though it was not obvious - to make up for her diminished lung capacity, but after coming out of anesthesia she did not have the strength to do that, and needed supplemental oxygen. He invited me into the operating room so I could be with her. She was still using the oxygen, but Dr. Crumb said her color was getting better. Her eyes were barely open. I remembered long ago that half-awake look at Dr. Gold's office. But that was a young bunny who had just been cured, not an old bunny with a rapidly spreading condition who needed oxygen. Dr. Crumb explained that from the look of her lungs on the x-ray it would only be a matter of time - perhaps hours or days - before we'd need to give her oxygen again. I softly petted Fiona on top of her head and ears, her favorite places. "Do I have to make a difficult decision?" I asked him. "I'm afraid so," he said. I thought about the alternatives, such as Fiona choking in the middle of night. I knew what I had to do. I called Maureen at work. She wasn't expecting this. We had a somber, sad, and brief conversation. Dr. Crumb said I could have some time alone with Fiona. He showed me how to adjust the oxygen if she needed it. With tears in my eyes, I petted Fiona and told her she was our special bunny. Just as I did on so many vet trips, I told her that we always tried to do what's best for her because we love her. This next part is very difficult to write because it didn't go at all like I would have wanted it to. For a moment she was calm. Then she slowly stood up and wanted to jump onto the ground. In her condition, and with a hard floor in a strange room, I couldn't let that happen. I took her in my arms and held her on my shoulder, against my cheek. She was calm for a moment, then wanted to jump down. Why, I'm not sure. Perhaps I will never know. Normally she settles in when I hold her that way. Maybe something compelled her to want to jump. She had been willingly breathing on her own, and her color looked ok, but maybe she panicked and needed more oxygen. Maybe she just was ready to stop fighting. All of a sudden, she wiggled loose and jumped out of my arms. For the life of me, I don't know how I did this - especially since I only saw this out of the corner of my eye - but I caught her in mid-fall. I immediately returned her to my shoulder, with a little tighter grip, and opened the door and called Dr. Crumb. He came in and put her back on oxygen. But it seemed like this little episode took it out of her. She was fading. Dr. Crumb said "It looks like Fiona is making the decision for us." I could tell she was not all there. But she did not look like she was suffering. I kept petting her and talking to her. I gave permission for Dr. Crumb to give her anesthesia and then put her to sleep. As he applied the anesthesia, I told Fiona how much we always loved her. Through tears, I told her goodbye and kissed her. I said "Goodnight, Buns, see you later," as I did nearly every night for eight and a half years. Dr. Crumb administered the final shot and she was gone. I want to end this note not in in sadness, but in celebration and appreciation. Although the scenario when she had to leave this earth was not picture-perfect, it was probably about as good as could be hoped for. The condition that killed her was not long and dragged out. The penicillin treatment did not cause her much stress. 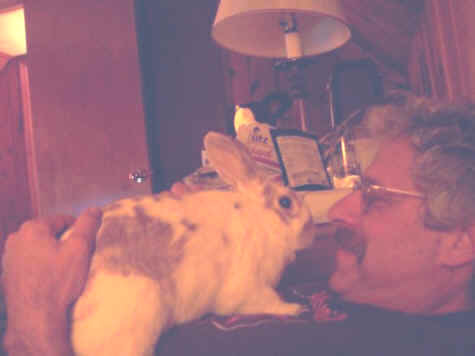 Even on her last day of life, she ate, groomed me, and flopped for a bit. Never did she hunch over or grind her teeth in pain. We picked the right day to go to the vet's - one day earlier and the condition might not have appeared serious enough; one day later, and ... I don't even want to think about the possibilities of her dying alone upstairs. Also, Dr. Crumb found some molar spurs that would have impacted her tongue by the next day and put her into full stasis. We avoided that - she ate some greens, hay, pellets, and treats on her last day. We happened to be at the vet's when the time came, even in the right room, and I was with her. Because Dr. Crumb was delayed a bit, I held Fiona for an extra-long time before the exam. Because I was totally in the dark about what was going to happen, the trip to the vet's was calm. And Fiona's last jump? Strange and disconcerting as it was, it gave me a chance to save her from a bad fall, and probably much stress and/or pain afterward, and it hastened the decision. Maybe she remembered that little talk we had a year earlier and was only trying to help. Nearly every day of her life with us, Fiona managed to give us little "chomp, chomp" noises with her teeth as we were petting her that mean "I like how this feels." It's a sign of happiness. Nearly every day she flopped luxuriously. Every day she was petted lots and she groomed me. That was a delightful bonding experience that I will cherish forever. Sometimes I would give her Eskimo kisses by rubbing noses with her - and sometimes she would reciprocate by licking my nose. She loved her treats, and really all her food. She enjoyed playing and exploring. She loved hanging out with us. We were a family. When we first got Fiona we knew very little about rabbits. We came to know that they are magical, magnificent beings. It is the most wonderful feeling to see your bunny - your little friend - racing in on those powerful hind legs to say hello to you. Fiona, you gave us so much joy and we hope we gave lots in return. We will love you forever, little Fiona.